✳ 2.5 or 3 stars? I can’t decide! ✳ I love Kristen Ashley's books. I always know what to expect from them. That's a good thing. That also can be bad. ✳ Well...I read my first K.A. 's book in October 2012 - Mystery Man - and I'm a big fan since then. Some of her books are my favorite - Fire Inside, Rock Chick Redemption, Motorcycle Man, Breathe - but others got a low rating (2 stars) - For You e Rock Chic (both with very annoying and immature heroines). ✳ I love the bossy alpha-male (always sweet) heroes who would do anything for their strong and funny ladies. And, of course, I really enjoy her amusing writing style and her stories are a promise of romance, emotion, action and humor. What's not to like? ✳ So what's wrong with this book? 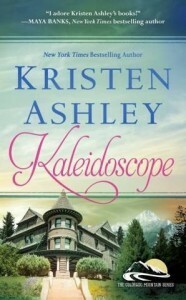 While reading Kaleidoscope I had the feeling that I had read this book before - Ok, it's a different plot, but for me the characters had the same personality as the previous ones - nothing to make them stand out. Maybe the boringness? And, let me tell you, I was excited to read Deck's story since I met him in Breath. ✳ Oh, it wasn't all that bad, the book had its good moments, but overall it didn't work for me. ✳ At 70% I thought: "Yeah, it was worth the waiting! Finally!" and I almost cried! Some heart-breaking moments. ✳ I couldn't connect with Deck and Emme and I didn't feel the passion between them. It wasn't natural. ✳ And what about that epilogue? It was totally rushed and not-incredible! Am I going to read her next books? Yes, because I believe Kristen Ashley is a good writer. In fact, I'm going to read (in the near future) the Fantasyland series - very good reviews!